Before launching myself completely into the debut of Longbourn to London, I cannot leave The Red Chrysanthemum behind without including one more flower used by both Darcy and Elizabeth in their nosegays to each other. 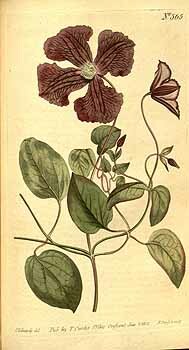 Identified as merely “clematis” in the story, the specific plant they would have found festooning the fences of Pemberley would almost certainly have been Clematis viticella (pronounced “vie-te-sel-la”; Latin, not Italian), the purple virgin’s bower. 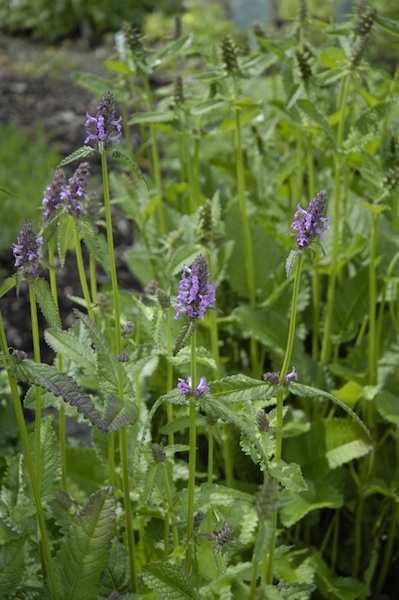 This species, native around the Mediterranean Ocean and well into upper elevation habitats in the Middle East, was brought into common cultivation in England during the reign of Queen Elizabeth I, so naturally its common name pays homage to her. Given my love of Elizabethan history and my affection for this genus, I wanted to include it in the tale. When my research revealed its meaning is mental beauty, cleverness, or wit (depending on your source), it was all a perfect fit for Elizabeth and Darcy. The only clematis native to England is Clematis vitalba, called variously traveller’s joy, old man’s beard (for the shaggy silvery seed heads), and the virgin’s bower (again for QEI). It has its own meaning, filial love. This is hardly appropriate for Darcy and Elizabeth. The other clematis commonly listed in herbals is the evergreen clematis, which in the early 1800s would not have been some relation of Clematis armandii, but rather the winter-blooming Clematis cirrhosa, from northern Africa and the Middle East, which is, in fact, evergreen when grown in mild or sheltered situations in the British isles. It means poverty! Hardly an appropriate flower to give a man with 10,000 a year (and very likely more!). The Regency era saw many wonderful plants arriving from plant explorers active all over the world, plants seen first in the gardens of the wealthy and interested. Surely during the time of Darcy’s mother Lady Anne Darcy, interesting plants would have been cosseted by her as a lady of fashion who was devoted to her husband and estate. 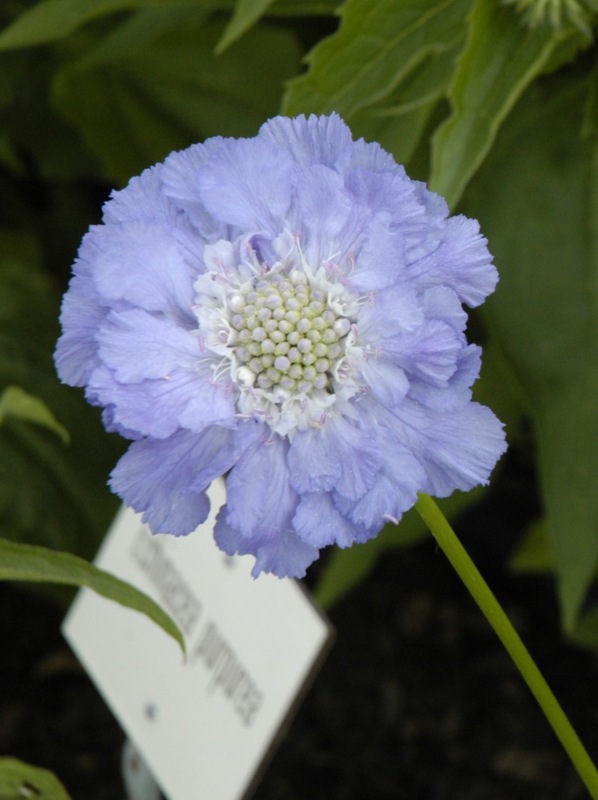 The large-flowered hybrids we grow today were nearly fifty years off in their first development. At Pemberley, Clematis vitalba would have been left to the wild places, and Clematis cirrhosa would have been too tender for anything but conservatory cultivation. That leaves the hardy and lovely nodding pagoda roofs of the purple virgin’s bower to blossom through the summer, adding a touch of impertinence and activity to the formal gardens. If ever a plant embodied Miss Elizabeth Bennet, it is this particular clematis. The flowers branch in trios from the main canes on 8-10 inch flower stems, a perfect length for inclusion in a nosegay. The illustration here, from ~1800, shows the flowers to be a more violet hue than the typical purple, but the profile image is spot on. Clematis viticella has continued to be popular in gardens, and it is still widely used in breeding durable, floriferous, and relatively easy-care hybrids. Just as Elizabeth and Darcy remain vibrant in our modern age, so too does Clematis viticella, the flower of wit. Let’s believe Jane Austen would be well pleased. This entry was posted on June 29, 2014, in The Plants in The Red Chrysanthemum. This entry was posted on November 16, 2013, in My Books, The Plants in The Red Chrysanthemum. This entry was posted on September 19, 2013, in The Plants in The Red Chrysanthemum. 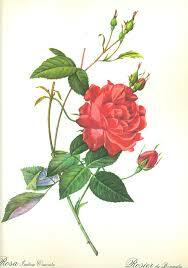 The rose ‘Slater’s Crimson China’ is the model for Darcy’s open rose in his nosegay for Elizabeth. It is our “cover girl” rose, if you will, the inspiration for Janet Taylor’s lovely back cover of The Red Chrysanthemum. This is a rose with a great story, and it is still in cultivation over 200 years after its debut. It is certainly a rose Lady Anne Darcy would have had in her garden at Pemberley. Remember, the earliest European rose species were not truly red. Deep burgundy, brilliant pink, even cerise, yes, but true red, no. The species that gave us genes for the vibrant red roses we grow today came from Chinese species and hybrids (the Chinese were hybridizing roses centuries before the Europeans made any planned crosses). What made the Chinese bloodlines even more remarkable was that they also had the capacity to rebloom throughout the growing season, a characteristic called remontancy, missing from European or even Near East species. The earliest of these Chinese hybrids, arriving in Europe in 1781, was a repeating pink shrub now known as ‘Parson’s Pink China’. It was followed in 1792 by a red form, which came into England via the British East India Company, and was known as Rosa sempervirens (literally, always flowering), the Bengal Rose, and finally as ‘Slater’s Crimson China’, because a Mr. Slater was the first to sell it. A yellow and another pink rose followed just a few years later, and these four roses became collectively known as “the four China studs”. Well, you put the word “stud” with a rose name, and honestly, only one Austen romantic hero springs to mind. When it comes to the China studs, ‘Slater’s Crimson’ may be the studliest of them all. It was most likely this rose that was the sperm donor for a group known as the Portland roses (still great roses to grow if you can find them), providing the repeat-blooming genetics that made the Portland line so popular. And, obviously, it was truly red. The Portlands in turn were bred with other roses of Oriental origin to produce the Hybrid Perpetuals, these were bred with the Tea group, and shazaam! we have our modern Hybrid Teas. Lift the sheets, so to speak, of any modern red rose, and you are likely to find ‘Slater’s Crimson China’ blinking at you, and telling you to turn out the lights so it can get back to business! From Peter Beales’ book Roses (Henry Holt Company, 1992), here are the specifics of ‘Slater’s Crimson China’: a 3 x 3 foot shrub, well branched with dark green foliage; sparse, broad, flattish thorns; flowers semi-double [meaning more than 5 petals but less than 40-lb], crimson to red in color with random occasional streaks of white. Needs full sun, best against a warm wall. Continuous blooming, and a good choice for growing in pots. Just about every characteristic of ‘Slater’s Crimson China’ made it the perfect rose for Darcy to select to say, “I still love you”. This is the traditional meaning of an open rose, implying a lasting mature love, where an opening bud might imply affection in its infancy. Red has always invoked love. Since the action of this story mainly takes place in late July, I had to find a rose easily available in 1812, and capable of blooming all summer. Most of the old garden roses of European origin would have been long finished by the first of July, let alone the 25th! That ‘Slater’s Crimson China’ also happens to be an acknowledged stud, well, it’s just a very happy accident.